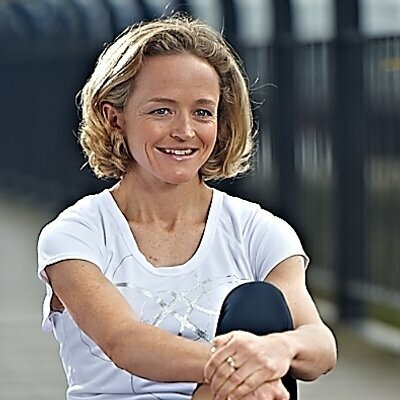 FORMER Olympic marathon runner Maria Yamauchi made a flying visit to Bath recently to give an interesting talk about her life as a runner. Yamauchi (left), whose lifetime best of 2hrs 23mins 12secs puts her second on the UK All-Time Rankings behind Paula Radcliffe, geared her talk on preparing for a spring marathon and then followed up that with a practical demonstration of drills and a session on the track. The session clearly got many of this present thinking and I was interested to note these observations from Team Bath runner Thomas Davies on the talk and Yamauchi’s tips on preparing for a marathon. ‘After the classroom session, we headed out to the track and Mara put us through our paces. ‘First off were a set of increasingly complex glute activation exercises, which taught a lot of us about our neuromuscular control (or lack thereof!). ‘Secondly a set of running drills. These felt nice and comfortable, and Mara seemed impressed by how well drilled Paul (King) has got us, but then Mara upped the standard introducing drills that involved complex changeovers, and getting the left & right legs to do different drills at the same time! ‘For the track session itself, Mara had us do a “pace change” session ­ km reps with an all out effort for 200m after the end of the first lap (i.e. 400m, surge for 200m, 400m). With 200 jog recovery. ‘The idea being it simulates surges in races, and also forces you to try and recover from the effort while still in the middle of the rep.
For anyone preparing to race a marathon this year that is a session well worth considering.